To the northeast of Sealy, along the Mill creek, stood Cummings Mill, the first water-powered mill in Texas (1826). and his troops across to Groces Landing would also carry the body of Stephen F. Austin to his burial place at Peach Point. To the southeast of I-10, at the Brazos, lies the site of Button Willow Lake. Legend states that this is the site where Santa Anna buried two cannons filled with gold before marching on to San Jacinto. near Sealy. The site is now known as "Texas' Oldest Human Cemetery." Organized in 1885, five years after the railroad town of Sealy was founded, St. John's has served the community with worship and outreach programs. Among the church's many supporters was railroad official George Sealy, for whom the town was named and who served on the missionary board of the Episcopal Dioceses of Texas. The congregation's first building, erected two blocks north of this site in 1889, was destroyed in the hurricane of 1900. A new church structure was erected at it's current location in 1910. 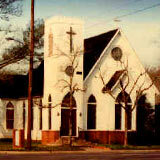 The Southwest Czech Presbytery was organized in the Czech Presbyterian Church in Sealy, Texas on November 3, 1911, by authority of the Synod of Texas. There were then four Presbyterian parishes and eight ministers in this body using the Czech language.